Bob Hurst, bass; Jeff Watts, drums. 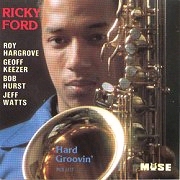 Hard Groovin' represents an important part of Ricky Ford's present-day arsenal. "It's something I wanted to do for a while, tap into a younger source. The younger guys give you another type of look, allow you to re-investigate set forms." Just how did Ford scout and assemble this five-piece unit? Pretty logically, pretty much the way he was approached. He "solicited" both Roy Hargrove and Geoff Keezer right out of Berklee where the two studied in Fall 1987. Ford knew of Hargrove and was duly impressed; Keezer actually came to Brandeis to try out. As for the pianist's rhythm mates, Ford says he always likes "to pick a bass player and drummer at the same time. It's a touchy situation; they tend to gravitate toward each other." In this instance, he knew Watts from, of all things, a luncheon gig they did together at Columbia University. "It was funny," laughs Ford, recalling the affair. "We played all these hip tunes, but we had to play them real quietly, in the background. We had a ball, though." As for the eight pieces that surface on this date, they again underscore Ricky Ford's strengths, his overall maturity, his ability to balance mood, tempo, and literature. They highlight his compositional technique, and his ever-improving arranging skills. Not surprisingly, Hard Groovin' not only holds together well, but also sounds great, moves, segues seemlessly, naturally, effortlessly. The date opens with "Masaman," a Keezer original that begins in a chordal tradition reminiscent of Herbie Hancock's "Maiden Voyage." Quickly, however, Keezer moves in a more upbeat, modern, hard-bop direction. The change allows for some angular ensemble playing that, in turn, leads us into three successive penetrating solos. First, we hear from Ford, then Hargrove and subsequently, from the composer before arriving at a resolution. "I knew he composed," says Ford, referring to Keezer, stressing Art Blakey and even Stan Getz not only welcomed sidemen's contributions but also encouraged them. "It's a good vehicle," comments Ford. "it gives (the players) some impetus." "Mr. C.P.," the first of five imaginative Ford entries, follows. Fully titied as "Mr. Charlie Parker," it's also apparent the leader's experience recalls "Mr. P.C.," the famed John Coltrane classic. This deceptive piece commences in romantic ballad-like fashion with a trumpet and tenor counter melody that intertwines before--out of nowhere - Ford launches into, at break-neck speed, a scorching solo. Once he plateaus, the tenor moves smartly, first into a swing tempo, then, subtly, he eases into a two-chord blues before Keezer, then Hargrove, respectively, attack the complex three-section process. "It's three tempos in one song," notes Ford, who originally wrote the piece without piano in mind on a bus in England. "It's 4/4 time played in straight, then double, then quadruple time." The tune finishes, as it started, as a neo-ballad. Ford calls the next entry "New Bop," saying he designed it to "integrate (the studio into) a practically functional medium on my records." This is a swingin', straight-forward affair, a classically arranged solo vehicle exposed collectively until its conclusion. Next up, yet another Ford original, the saxophonist's ecologically inspired, reflective but hopeful "Deep Dumping Blues." There are lyrics, too, says Ford. "D.D. Blues," it seems, stands as part of a compositional series Ford developed based on land preservation. The saxophonist intends the piece to level a planetary warning. The title track follows, beginning delicately, almost timidly. Hurst makes the most of his solo opportunity, dictating the tone, then withdrawing before Keezer picks up the 4/4, blues-tinged arrangement. A muted Hargrove follows the pianist and precedes an almost Texas-tenor sounding Ford who, appropriately, steps front and center driving his troops forcefully to the finish. In many ways the title track exploits the youth movement to its fullest. Ford says he wrote "Hard Groovin'" as a "more contemporary piece . . . with these guys in mind." Meanwhile, the tenor saxophonist successfully alters the set with his gorgeous "Fundamental Mood," a breathy ballad with standout pacing and phrasing. Ford's tone, rich and full-sounding, allow us to hear Dexter Gordon calling; Hawk is listening too. Immaculately articulated, Ford says he wrote the piece "based on 'In a Sentimental Mood'." Hargrove sits as Ford, in quartet, gently airs it out before and after Keezer steps in with, undoubtedly, his prettiest solo of the date. An energetic reading of Fats Waller's great "Jitterbug Waltz" follows. It's one of two non-originals, however, it's unmistakably Ford's vehicle as he serves two extended rollicking solos sandwiched between a lighter, but still quick-paced Keezer run. "I've always loved it," says Ford of the familiar and now-popular piece. "I finally had a chance to record it. I view (this rendition) as fresh. It's not a straight, but (rather) a liberal interpretation of the melody, faster than the original--with triplets." Finally, in quartet, and on alto rather than tenor, Ford delivers "Minority," by Gigi Gryce. Like Hard Groovin' itself, "Minority," which closes the set, pulls no punches; the uptempo piece, while showcasing the versatile leader's skills, lets us have one more earful of the talented Keezer and his rhythm mates. The overall even-handed execution highlights Ricky Ford's intent to make a complete and honest musical statement. --JON W. POSES, from the liner notes.